MasterPieces: Time-Flight | Warped Factor - Words in the Key of Geek. If you claim to understand Time-Flight, one of three things is probably happening. Either a) you’re bluffing to look like an uber-geek, b) you’re mistaken, or c) you’re absolutely stark raving mad. Time-Flight goes far out of its way to avoid being understood, with almost the same professional perversity that David Bowie applied to the task – but without his everlasting enigmatic charm. Anthony Ainley was a Master very erratically served for storytelling, but he was probably never given more challenges than is his first proper season in the black velveteen. 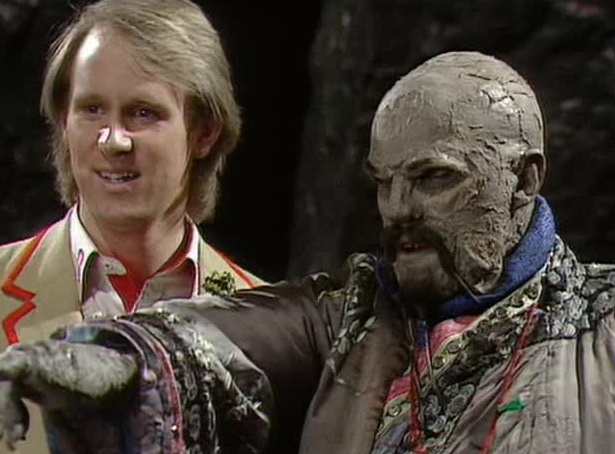 Having made a decent fist of the reborn Master in Logopolis, being by far the most luminous and enthusiastic thing in a story with a script dryer than matchwood from buzzkill-general Christopher H Bidmead, he returned to menace the Fifth Doctor in Castrovalva. Again, he’s by far the best thing in the story, so things were looking up for this new, suave, chuckling incarnation of the Master. Anyone who can bring one Bidmead script to life is some kind of Frankensteinian genius of resurrection. To perform the same miracle with two Bidmead scripts back to back puts Ainley in the ‘raising Lazarus from the dead’ category of actors, because as scripts, both Logopolis and Castrovalva reek of earnest self-congratulation and maths homework. Ainley makes both of them watchable, if not perhaps must-see Who – even the chuckling raiser of corpses had his limits. Speaking of which, the next time Ainley’s Master was seen was in Time-Flight. Let’s be honest – the Production Team of Doctor Who under John Nathan-Turner made many errors during its time. Allowing Bidmead anywhere near a drama programme watched by living humans was one. Running The Twin Dilemma the week after The Caves of Androzani and then ending the season would be another. In between, there was Time-Flight. To be fair, it must have sounded like a great idea for an interesting Who story – ‘Let’s do something with Concorde!’ To be even fairer, it still sounds like a great idea. It’s just a dreadful idea to run it at the end of Peter Davison’s first season. And then, the week after the cool new Cybermen with their ‘Excellent’ new voices, and the week after the Tardis lost its first companion to a monster since Sara Kingdom in 1965, came Time-Flight. Yes, arguably you need a bit of runaround fun after the heavy ending of Earthshock, you can’t end the new Doctor’s first season on that silent note – it’ll look as though he’s not up to the job. Even so, as an antidote to Earthshock, Time-Flight is pretty much The A-Z of Things Not To Do. Time-Flight’s visuals are especially laughable, draining the optimism of the audience after Eathshock. The Plasmatons are very clearly blokes in shapeless grey rubber suits and the cliff-hanger to the first episode is essentially a washing-up bowl full of frothed-up dish-soap. 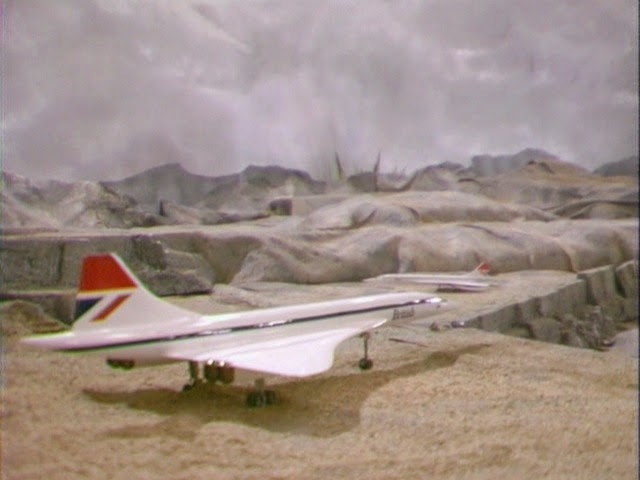 The scale of the visual ask of Peter Grimwade’s story is simply never matched by the budget or the imagination of the Production Team – the model shots are self-satirising to almost the same degree as the dinosaurs from Invasion of the Dinosaurs (their only saving grace being that no-one thought it would be a good idea to make the model Concorde move). The CSO is still almost as dodgy as it was back in the days of Underworld and Meglos, and there’s an all-encompassing sense of not even being able to afford a gravel pit for this story. It looks like a great idea barely even half-baked. What’s more, that sense of unfinished thinking extends to much of the rest of the story too – the characters are mostly ciphers (Captain Stapley, played by Richard Easton, being a notable exception), who are there in the main to mill about and be used either by the Master as pawns or by the Doctor as additional pairs of hands. Nigel Stock’s Professor Hayter wanders about in ‘Pertweean expert’ mode for a couple of episodes, and then decides, apparently on the spur of the moment, to sacrifice his life because, for reasons that are never made even remotely clear, a sacrifice is needed to allow the Xeraphin to communicate. The story is partly borrowed direct from The Time Warrior (advanced alien stranded in the back end of time throws a net forward as far as they can, captures people, brings them back), though the Master’s reasons for doing so are rather less sound than Commander Lynx’s. He seems to need them to break through a wall and just possibly to use as boil-in-the-bag protoplasm if necessary. Not for nothing, Time-Flight even borrows Professor Rubeish from The Time Warrior, makes him rather more snarky as Hayter, and gleefully, pointlessly kills him off. The idea of using the collected life forces of an alien race as a new Tardis engine component is frankly barking mad and nothing but a scripting convenience. The idea of that species partially wanting to be used that way is also barking mad. The idea that the Master can’t escape that time zone until he can is another monumental piece of script-spinning convenience, and again, barking mad. The phantasms that plague Nyssa and Tegan on the way to the heart of the Citadel – well, possibly barking mad, but not mad enough to stop Terrance Dicks re-using them almost word for word and scream for scream the following year in The Five Doctors. But none of that is as barking mad as the main barking madness at the heart of Time-Flight’s toing and froing. And that of course is the Master. It’s important to remember that when the Xeraphin first refer to the Master, they call him a Time Lord, so we can assume they know him in his slim, chuckling Ainley form. Which burns away the last vestige of in-story reason why he should, for the first two episodes, be faffing about the place as the chubby oriental sorcerer Kalid, even when there’s nobody there to observe him but us. Ainley does well to convince as Kalid, but nevertheless, the character himself is like Ronnie Barker pulling a racial stereotype out of the bag for the whole first two episodes FOR NO GOOD REASON WHATSOEVER. The real reason of course is to disguise from us the viewer that the Master’s back again, and it at least partially succeeds in that, but scriptwriting nonsense with the sole intention of pulling a reveal just won’t do. At least when the Master next tries more or less exactly the same trick, as Sir Gilles Estram in The King’s Demons, he’s living among the locals, so there’s a logic to it. Here? Logic Be Gone. We did say going in that Ainley was very erratically served for scripts as the Master, and the needlessness of the whole Kalid deception serves him particularly badly, for all it gives him a chance to echo Delgado’s bizarre incantations when summoning Azal in The Daemons with his own nonsense-sorcery. Once he’s shed the disguise after, by the way, a non-explosion that makes him fall over a bit sideways and start insanely frothing green goo from the nose and mouth, Ainley’s Master here is largely wasted. He steals a couple of brief scenes – ‘Shall I say au revoir, Doctor?’ – but for the most part, in Time-Flight, the Master continues in his Logopolitan vein, working together with the Doctor on a trade for parts. Perhaps his brightest, most eminently Ainley moment is when he begins to grow impatient with the Doctor’s stalling, and suddenly realises he could begin to kill the Concorde passengers by way of giving the Doctor an incentive. There’s a sudden almost yawn of waking joy in Ainley’s eyes, and his voice drips honey as he promises to start doing so, that once again rescues some kind of coherent Master portrayal from the blandness of poor scriptwriting. Time-Flight was a good idea, destroyed by an under-written and poorly thought-through script, some generally bland performances and a budget that rendered prehistoric Earth in Studio 8 at BBC TV Centre. 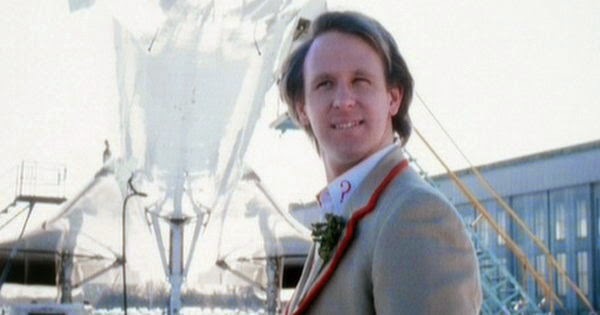 It’s Peter Davison’s biggest regret, and For Ainley’s Master too, it promised much, and delivered only confusion and many traps of forgettability.